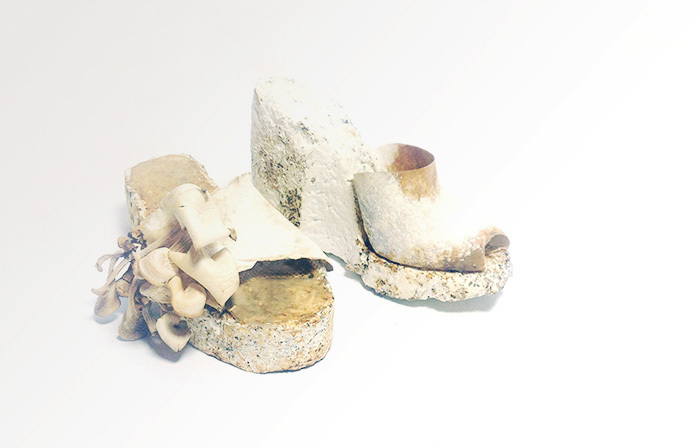 ‘Growing Shoes’ shows the results of experiments in Mycelium to see how shoes can be shaped into solid and hollow models. Solid shapes function as heels, platforms and insoles of the shoe. In order to achieve these shapes, different waste streams such as coffee grounds and sawdust are used as substrates. The hollow shapes are grown pure in bottles or on fibers such as hemp and psyllium to achieve strength and structures. After harvesting, the pure Mycelium becomes a clay looking white material is then used to cover some parts of the heels or moulded onto the lasts.